Our winner is Christiana P.
Be sure to watch your email for a message from Kristi! Regular readers here in the Ruins are likely already familiar with Kristi Charish, whose debut novel, Owl and the Japanese Circus, I had the pleasure of reviewing last month. This is a book for fans of urban fantasy who are looking for something a little different, with Kristi managing to successfully reignite my excitement for a genre that I felt was becoming tiresome and repetitive. There is already a sequel on the release calendar, along with her first novel in a new series, which is actually what brings her by today . . .
Over the past two weeks since my debut novel OWL AND THE JAPANESE CIRCUS came out I've been hitting the blog tour/promotion circuit. It’s been an absolute blast talking to readers both this side and the south side of the Canada/US border, but one of the themes that keep coming up this side is getting published in Canada. So that’s what I’m here on Beauty in Ruins talking about today. Now, my first disclaimer before you read anything below is that I’m new to the game. Very new. I only started writing in Feb 2010 (I was on vacation) and finished my first novel (OWL) in the spring of 2013. After querying I was picked up by my agent, Carolyn Forde at Westwood Creative, and by the fall had a contract for the first two books in the OWL series with Simon and Schuster. Back in December, I signed three books in my second urban fantasy series, KINCAID STRANGE, with Anne Collins at Random House Canada. One could successfully argue I’m too new to the writing/publishing game to know what the hell I’m doing (it’s a fair point). One could also argue I managed to get five books in two series under contract with publishers before the first book came out so I must be doing something right. Personally, I figure it’s probably a bit from column A and a bit from column B, plus a whole heaping bucket load of luck. The point is take absolutely everything I say below with a grain of salt. With that heavy disclaimer, I give you 9 things I’ve come away with over the past five years about publishing and getting published. I went into the querying process (sending out a letter to agents asking if they want to see your manuscript) fully expecting to be rejected by at least 50, maybe accepted by the 100th, and then have my first novel not sell. Harsh expectations but this was the consensus, the average publication path most speculative fiction authors out there had experienced. Heard back from Carolyn Forde (who represents Ian Hamilton, one of my favorite authors) the day after I emailed her. A manuscript request and phone call later I had representation. What is the take away from my experience? The publishing world isn't fair and though it has a lot of patterns there are next to no rules. Everyone’s path to publication is going to be different. I repeat: Mine was unusual. That isn't to say my path to publication isn't valid- it could and does happen to new writers all the time – but it’s not an accurate representation of how getting published is supposed to go. Go into publishing with as few expectations as possible and if someone feeds you a line about rules, run. They’re probably trying to sell you something. 2. First time out you might want to go traditional...or not. I didn't go the self-pub route so I can’t say much to that. You’d be much better off seeing what Hugh Howey, Amanda Hocking, and E.L James have to say, as all three have had huge success. As to traditional publishing? I like having an agent. My agent strategizes with me about my long-term career goals and has the connections and publishing industry know how to get my manuscripts in front of the right editors. She deals with the legalities of contract negotiations and it’s her job to make sure I sign the best deal possible for my book and my long-term career goals. My agent/agency also takes care of overseas and film rights, which can be tricky. So far I've found having an agent a huge help to my writing career and well worth the commission. I also like the advantages that go with having traditional publishers. They've sold books before and they have a much better idea than I do about how to package and market a debut novel. They arrange editors, cover artists, marketing plans and strategies, promotion, reviewers, get books to retailers, and there is the matter of advances. Yes, as many authors have pointed out you now more than ever have to market yourself through social media, but going through a publisher, especially as a debut, opens a lot more doors than you think. Are publishers perfect? Of course not, nothing is, and neither is self-publishing. Pick the one that will work for you and keep your options open. 3. There are serious advantages to being Canadian. Like most writing/publishing advice out there, there is some truth to the statement. New York is still where the heavy hitters of the publishing world reside. But in my experience, there is a huge advantage to being a Canadian author. First, there are fewer of us, and that’s not marginalizing the Canadian reading population or publishing world. On the contrary, when Canadian writers throw their hats in with the Americans, not only are they competing with each other but with all the Americans and every other hopeful writer on the planet. A lot of bestselling Canadian authors (Ian Hamilton, Yaan Martel, Kelley Armstrong) have Canadian agents. Canadian Literary agencies are more than capable of negotiating with New York and over seas publishers and do so on a regular basis. The best part? They represent Canadian clients. Yes, there are fewer agencies in Canada than in the US, but they’re an option for us that the Americans don’t have and shouldn't be over-looked. I feel I've had more opportunities working with a Canadian agent and agency than I would have had otherwise. We also have access to the Canadian publishers. All the major publishing houses have branches in Canada and publish under their own imprints. It’s not easier – there’s tough competition from other Canadian authors and there are fewer editors buying work – but it’s an option our American counterparts don’t have so why not take advantage? 4. Some Things you just can’t buy. If you take no other advice off this list, please, please, for the love of assorted Gods and your bank account, please, take this one. For total transparency below I've listed my total expenditures on workshops and conventions before I was published. It was less than 500 dollars. Vancouver Public Library Workshop with writer in residence Spider Robinson: FREE, as in world-class writer, no money left my pocket. And I’m not talking about the cover (though covers can totally make or break a book. For example, imagine your favorite action/adventure with a full on romance cover. The readers who pick that up are going to be real pissed). In this case I’m talking about another kind of dressing. The prose. There’s a real propensity for critique groups and workshops to focus on prose- the way you convey the story rather than the story itself. This may upset one or two critique group workshops out there, but the more I learn about the craft of writing (and the more professional authors I meet), this strikes me as an amateur’s mistake. It’s like worrying about how a gown for a ballroom dancing competition is going to look without asking yourself whether you know how to dance. The outfit helps you look good but if you can’t dance, no amount of trussing up is going to help. Twinkle Toes who showed up in the potato sack is going to win. The purpose of good prose is to make a good story look better, but people read a story for the story- especially in commercial fiction. No amount of fancy writing is going to make a lackluster novel better than a spectacular story – even if the spectacular story decided to show up wearing a burlap potato sack and Birkenstock sandals. And don’t doubt for one second this doesn't happen every day in publishing. In fact, once in the publishing door there are a slew of editors (content, copyediting, proofreading) whose job it is to fix up the typos, prose, and make sure the logic of the story fits. Yes, the story needs to be as ready to go as possible but wasting hours making it perfect is a poor expenditure of your time- especially when you should be working on the next project. Now, when I say ‘crazy test’ I am not in any way, shape, or form alluding to mental illness. That would be insulting. What I’m referring to is a writer’s ability to behave in a congenial/civil/constructive manner when discussing their work with an editor or agent, criticism and all. And the behaviors I outline below absolutely deserve the derogatory and insulting imagery the word ‘crazy’ evokes. The following behaviors all earn a ‘Crazy Test’ fail: Name calling the editor or agent, arguing ostensibly about your work, online flame wars, choosing to take insult without provocation, tantrums, refusing to consider constructive criticism, angry emails sent out at 3 am, and – my favorite – inappropriate comments or jokes involving anything to do with race/sexuality/religion/gender. Publishing is a business and you will be tested on your professionalism before anyone buys your book. Your enemy isn't a bad review. Your enemy is no review. There seems to be a real assumption going around with new authors that a bad review will prevent hordes of their readers from discovering their book. I haven’t seen it. In fact, the opposite is true. There is many a book I've picked up that’s been denounced as space cowboy trash (I happen to like space cowboys) or an urban fantasy that’s been ripped apart by reviewers for not enough romance (I actually prefer less romance, more adventure in my UF reads). The point is a bad review meant someone read your book and took the time to write something about it. Be thankful. Most people won’t bother reading. And, speaking of reviewers... Repeat after me: Those reviews are not the reviews you are looking for. They are written for other reviewers and readers. And that goes triple for the comment threads. 8. There is no such thing as a secret handshake. There is this perverse and pervasive myth amongst hopeful authors that if they just make the right connection, sneak into the right party, and figure out the secret handshake, they will earn admittance to the land of lollypops and unicorns, where editors pay you, the unproven debut author, to write a book they've never seen. No one is going to give you money to write a novel (except celebrities, and even they don’t get paid to write the book, a ghost writer with an extensive portfolio does). A novel is a product that a publisher is contracting from an author. Unless you have an extensive, commercially proven portfolio, no one is going to pay you for a product they can’t see. There is no secret handshake or mystical industry party in Shangri-la. Still don’t believe me? I was (still am in many ways) about as unconnected in the literary community as you can get. First, I have a science degree so no MFA or English department connections. I’m not really on the Speculative Fiction conference circuit (See number 5. Plane rides and conference tickets can get expensive) and though I've made a few local writing friends I’m still getting to know most of the writers in the Pacific Northwest. Yet that didn't stop my manuscript getting picked up off the slush pile or prevent publishing house editors from considering it. Remember what the product you’re selling is. A story. 9. “I’m a great believer in luck, and I find the harder I work the more of it I have.” Coleman Cox, 1922. No doubt about it, I've been incredibly lucky in publishing. I currently have five books under contract to two major publishers before the first one is out and I've only been writing 5 years. I also have worked harder at writing fiction than anything else I've ever attempted in my life. When I started I was getting up at 7am to write for a couple hours before heading to the lab where I did my PhD, then writing on the train home and until I fell asleep on the computer keyboard (my spousal unit has a lot of unflattering and very un-photogenic dirt on me). Once I switched to full time writing the pace didn't let up- I simply had more time to write. Get up at 7am, write. Break at 9. Then more writing. Gym at 5, then – you guessed it – more writing. And that’s not considering social media, promotion, etc. It’s 2 pm on a Sunday as I’m writing this article. Once I’m done, I've another article to finish, a podcast to go on, writing on my next novel I haven’t gotten to since my book came out. I won’t get to bed until maybe 10 or 11pm. 14 or 16 hour days are a reality for a full time writer. And I wouldn't change it for the world. 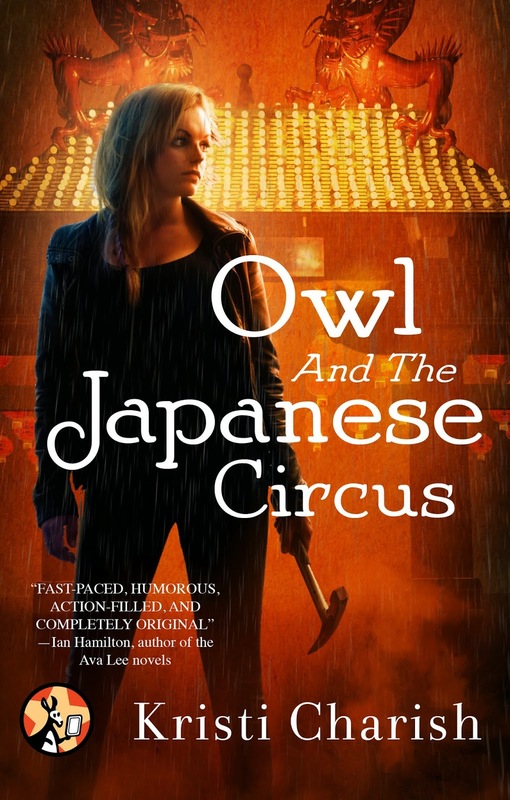 Kristi Charish is the author of OWL AND THE JAPANESE CIRCUS (Jan 13th, 2015, Simon and Schuster Canada/Pocket Books), an urban fantasy about a modern-day “Indiana Jane” who reluctantly navigates the hidden supernatural world. She writes what she loves; adventure heavy stories featuring strong, savvy female protagonists, pop culture, and the occasional RPG fantasy game thrown in the mix. The second installment, OWL AND THE CITY OF ANGELS, is scheduled for release Jan 2016. Her second urban fantasy series, KINCAID STRANGE (Random House Canada), about a voodoo practioner living in Seattle, is scheduled for release mid 2016. To help celebrate the release, Kristi Charish has kindly offered up one (1) copy of OWL AND THE JAPANESE CIRCUS for a lucky readers here in the Ruins (hardcopy for USA/Canada or ebook for International). Giveaway ends Sunday at midnight, and I'll draw the lucky winner Monday morning. Love supporting Canadian authors but finding it hard since I've moved so I'm super pleased about this post. This looks like a pretty interesting book. And then I read the author bio and I knew I would be hooked. I see Ms. Charish has a strong biology background (that's probably an understatement) and I do love fiction that incorporates biology into the story. I find that any damage taken by or inflicted by the main characters is written more seriously. Plus, any odd beasties are more realistic. Glad you enjoyed the post! It's funny how nationality can play into an authors career:-) As far as OJC goes, the sequel is out Jan 2016 BUT the ARCs will be available sooner than that. I'll make sure to tweet/post when it's up on NetGalley. KINCAID STRANGE is out May 2016 in Canada, but I will keep everyone posted on US release date news! Thank you Kristi for this incredibly detailed and enlightening post. Being a transplanted Canadian in the US, I found the topic particularly interesting, especially #3...so glad Canada has a great network of publishers and authors! Thanks for the informative post, Kristi. I didn't even know the VCC offers a speculative fiction writing workshop. Will have to check it out. Yes, I live in Vancouver and I'm fantasy writer too. I also read and liked your novel and reviewed it for Netgalley before it was out. Can't wait for the next one to come out. Definitely check out VCC though I don't know if they have a replacement instructor yet (Geoff Cole, the previous instructor is no longer in Van). Also check out Eileen's workshop at the Shadbolt Centre if you can. Also, the Stormcrow Tavern on Commercial Drive just announced a spec fic reading series!! I'm up on the 19th but there is a whole slew of authors slated every month from now until the summer. They have it posted on their FB page and it's on mine as well! If you can make one do! Lots of authors and writers so it should be a fantastic event. Awesome the post was useful! Being a Canadian author, blogger and tour coordinator (from Quebec, no less, which makes me stand out even more than most Canadians!) I found this guest post very interesting and enlightening. Thank you Kristi!